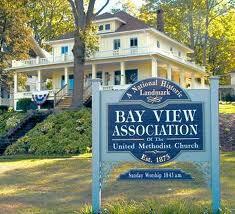 On Sunday evening, my wife Jan and I attended Vesper’s at the Bay View Association, a 137-year-old Chautauqua founded by Michigan Methodists on Lake Michigan near Petoskey. A Bay View staple since the 1800s when families gathered at the end of the day to sing hymns, this ongoing tradition has evolved into a magnificently eclectic concert series. I was reminded at this gathering that it’s a privilege to live and work “Up North” in Michigan during much of the summer. Although it’s easy to become distracted in such a beautiful natural environment, I remain solidly connected online, on my mobile phone and via FedEx with colleagues and clients throughout the world. Technology enables me. My life and especially my work in strategic communications has become, to a great extent, a virtual enterprise. The juxtaposition of my digital life online and the Sunday Vesper Concerts that bring thousands to the John M. Hall Auditorium at this Chautauqua-type summer assembly was captured perfectly by Bay View artistic director Chris Ludwa in the evening’s program. Live human interaction is, in fact, both transformative and memorable. Communicating in person is powerful. Isn’t it true that most memorable communication in life and work is delivered and received live? The creative, communicative power of a live performance is like oxygen to both performers and audience. I think in-person communication can have the same effect generally, when it’s authentic and delivered clearly. After all, unlike my e-mail inbox, the Bay View live performance had a beginning and an ending. It wasn’t delivered by webinar. No voice mail was involved. I even had a pleasant exchange at the Will Call window. And like the performance itself on Sunday night, Ludwa’s message was welcome.